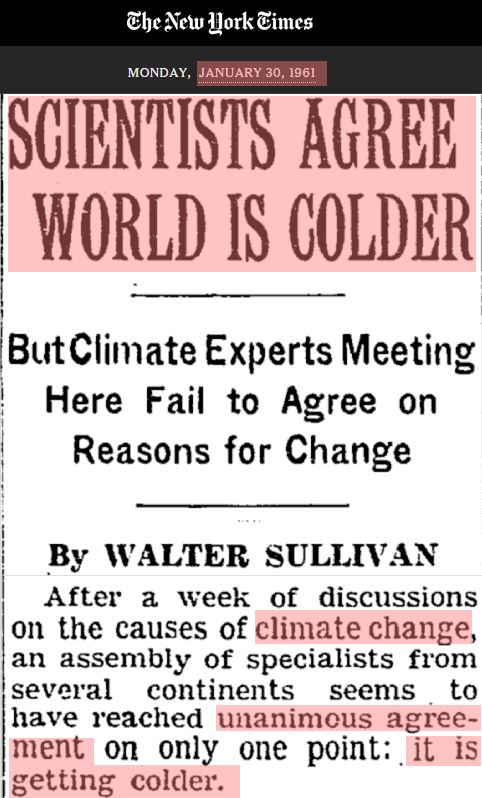 Einstein was just joking, but that is exactly what the Climategate team has done to the surface temperature record. We have all grown used to seeing graphs like the one at above from NASA, showing nearly continuous global warming over the last 135 years – with a flat period between 1940 and 1980, and 1.2C warming from 1880 through 2000. 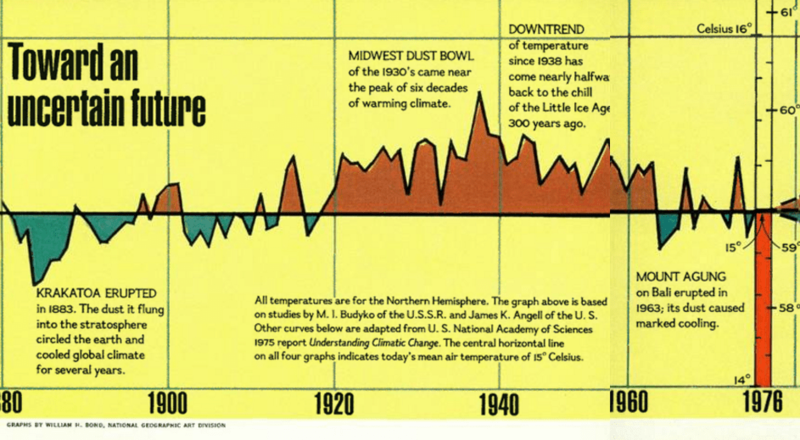 Much of climate science, journalism and public policy is based around the belief that these NASA graphs are an accurate representation of the temperature record, and that the apparent warming which is shown in the graphs is due to an increase in atmospheric CO2. It is therefore very important to understand the accuracy, consistency and integrity of these graphs. However, if we look at earlier versions of the same graph, we see something very different. 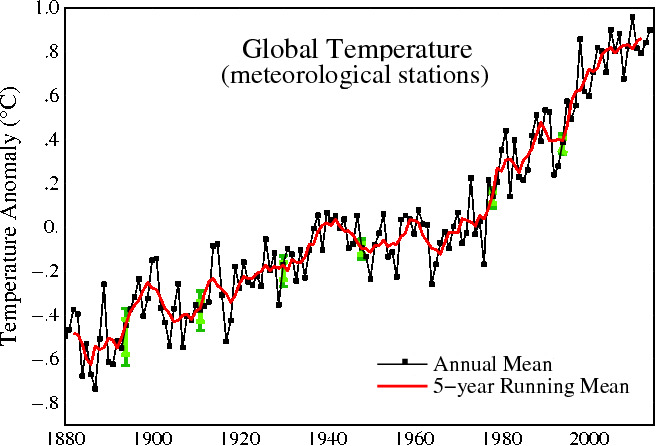 The graph below was published by NASA in 2001, and showed 1975 as barely warmer than 1880 – with less than 0.6C warming from 1880 to 2000. 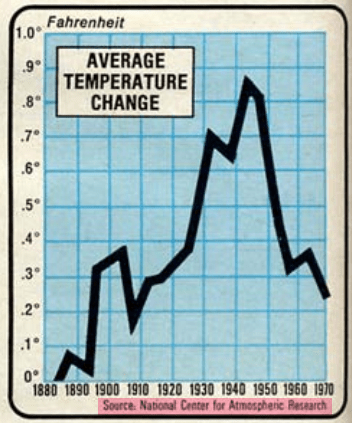 The 2001 version showed only half as much warming from 1880 to 2000 as the 2016 version of the same graph above. 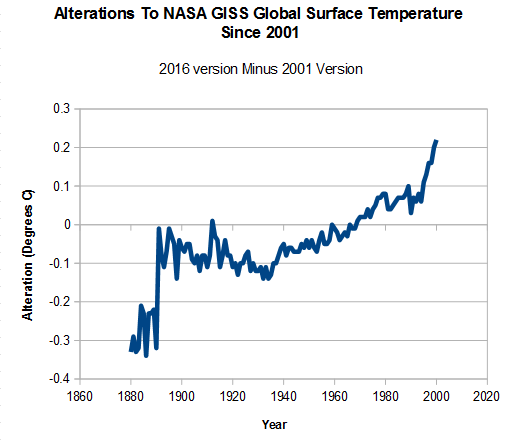 The recent increase of 0.6C in NASA’s reported warming over the 1880-2000 time period, is particularly troubling because the recent alterations extend far outside of their own error bars. The graph at right shows the 2001 version and the 2016 versions at the same scale, normalized to the most recent common decade. The blue lines represent the 2001 error bars, and the green lines represent the 2016 error bars. Note how the alterations are about three times as large as NASA’s reported error. This indicates a scientific process which is completely broken. 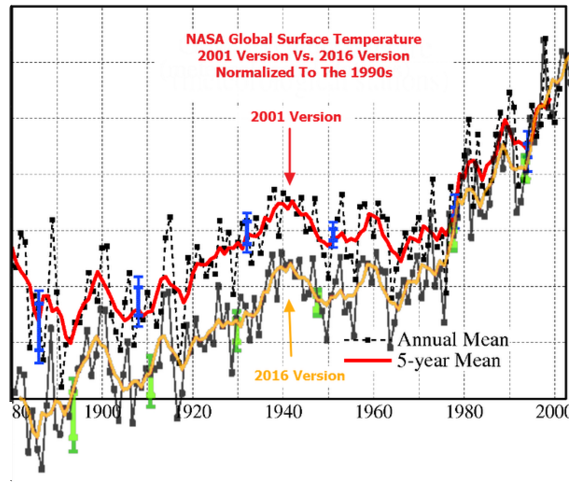 The graph below shows the changes which have been made to the NASA 1880-2000 temperature trend since 2001, a total of more than half a degree. The alterations have been almost as large as the entire trend reported in 2001, indicating a signal to noise ratio of close to zero. In other words, the NASA temperature graph is meaningless from a scientific point of view. 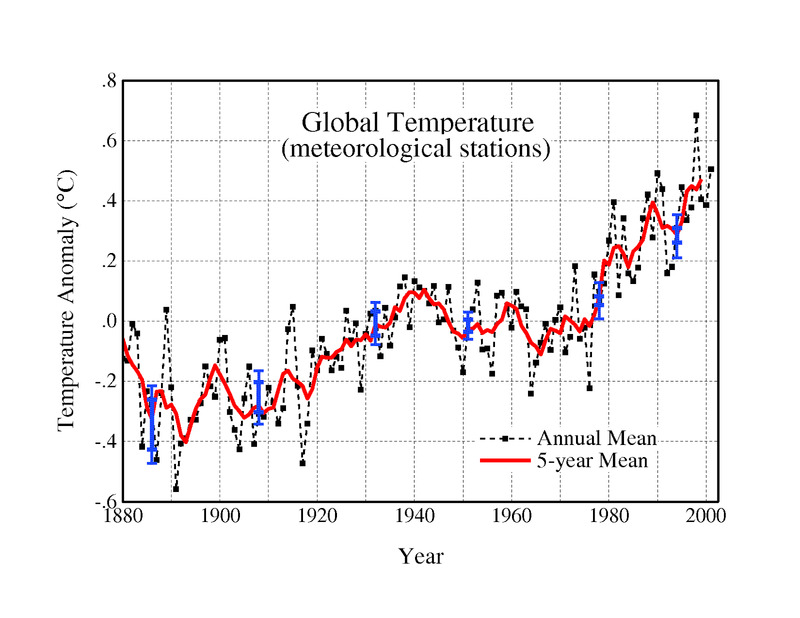 Going further back in time with published NASA temperature record, we see even larger discrepancies. 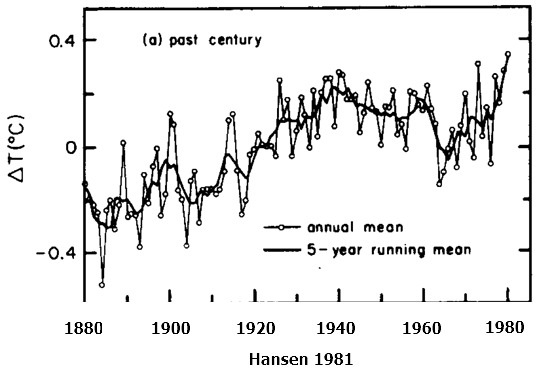 NASA’s James Hansen in 1981 (below) showed a spike in temperatures around 1940, followed by nearly 0.3C cooling until the late 1960’s. 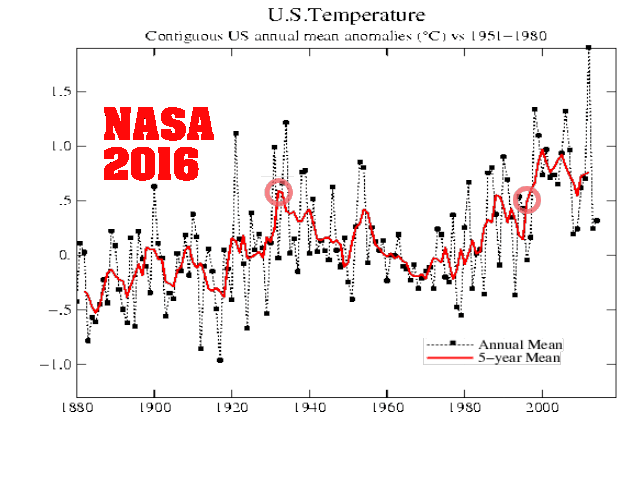 This spike and cooling has been almost completely erased from the NASA temperature record. The image below overlays Hansen 1981 graph on the current NASA surface temperature record, and shows how pre-1980 temperatures have been cooled. 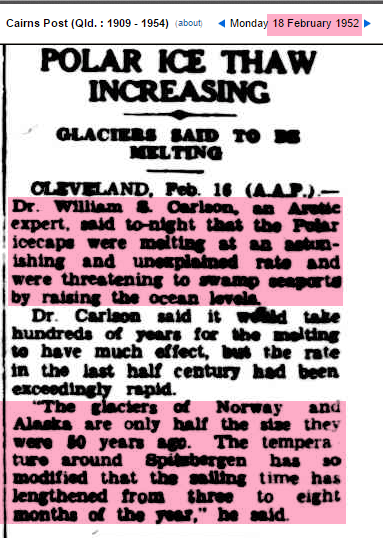 By cooling the past, NASA increased the total amount of warming, removed the 1940’s spike, and removed the post 1940’s cooling. These alterations did not occur all at once, but rather have occurred in successive stages, where the past is made cooler to create the appearance of more warming. 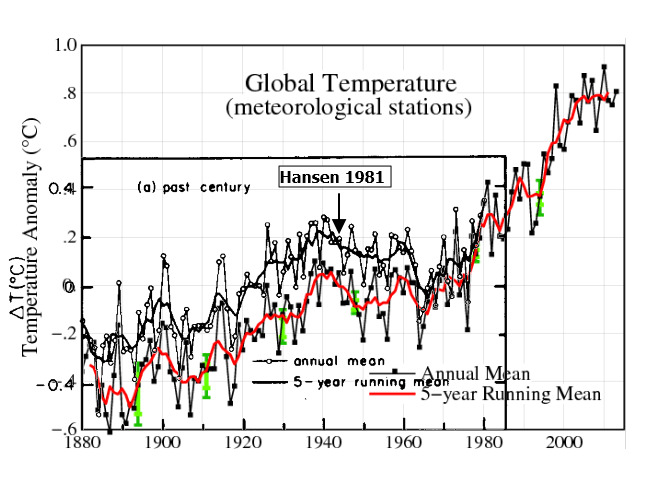 The amount of warming from 1880 to 1980 has been doubled since Hansen 1981. 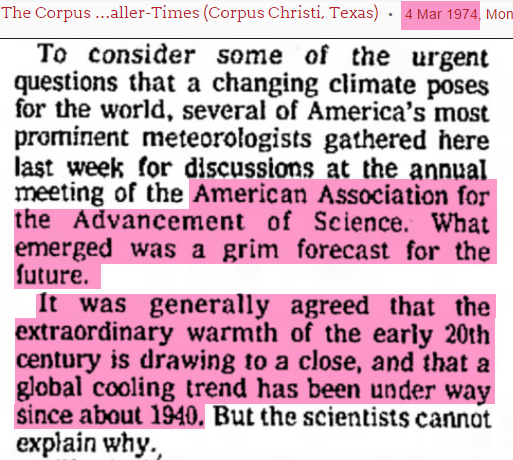 Before NASA was involved, the National Academy of Sciences and NCAR both showed even more post-1940’s cooling, and that Northern Hemisphere temperatures were no warmer in the late 1960’s than they were at the beginning of the 19th century. These graphs are completely different from the current NASA graph. That same issue of National Geographic included the graph below, and the following text. This downwards trend has been nearly erased by NASA and NOAA. 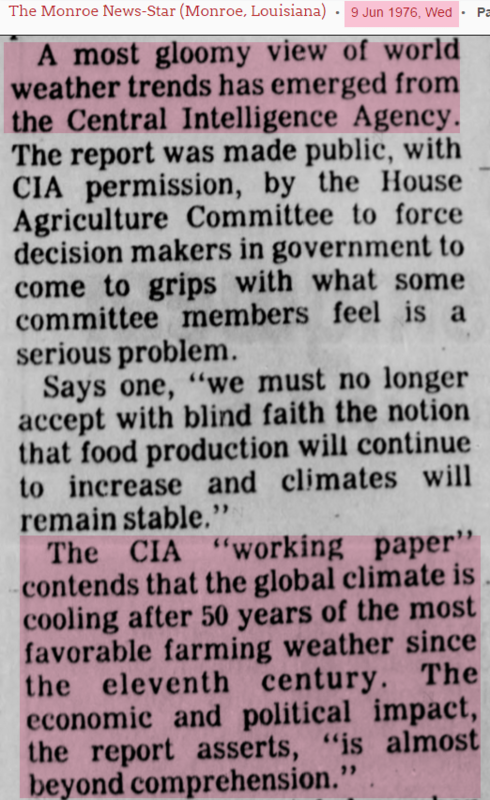 The CIA warned that the cooling trend threatened political stability. 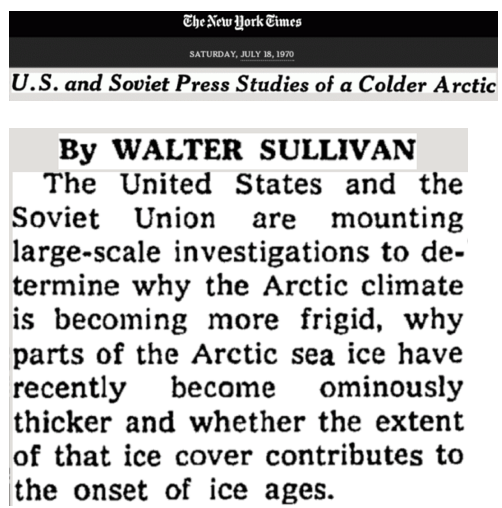 The US and Russia mounted ‘large-scale investigations to determine why the Arctic climate is becoming more frigid” and the ice was getting thicker. 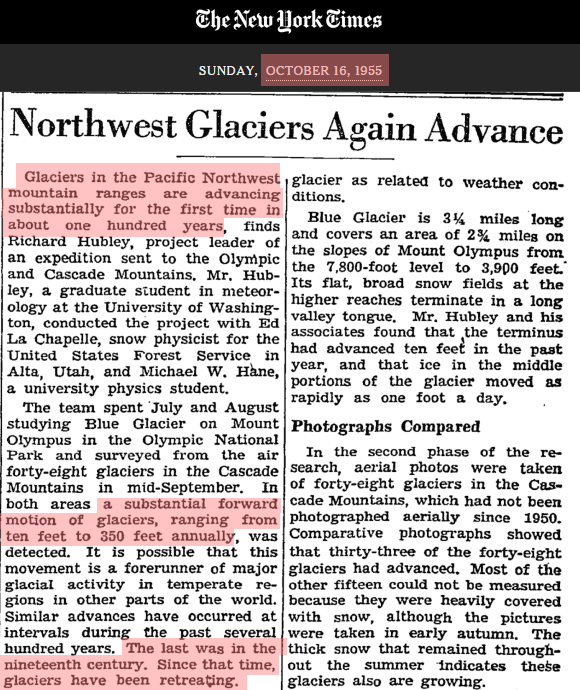 Further evidence for the cooling was that during the late 1950s and 1960s, glaciers were advancing for the first time in over a century. This cooling was a big change from the previous decades. 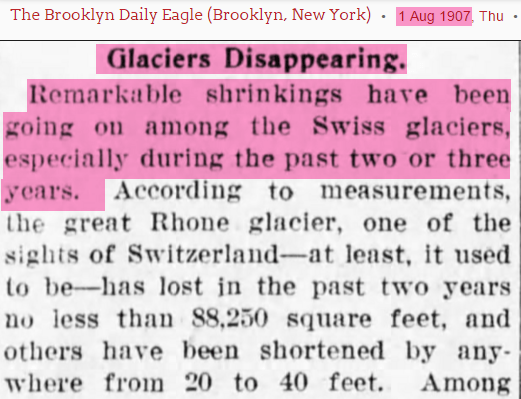 Glaciers were disappearing in the early part of the century, and many had vanished by 1923. 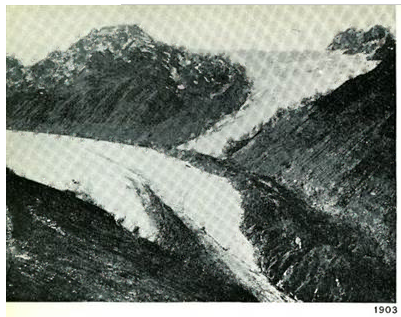 During the 1930s and 1940s, the glaciers of Norway and Greenland were rapidly melting and faced “catastrophic collapse.” By 1952 the glaciers of Norway and had lost half of their mass. 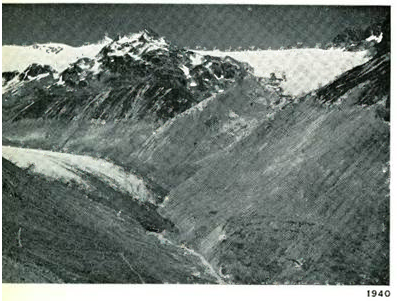 National Geographic showed images of rapid glacial retreat in the Alps by 1940. 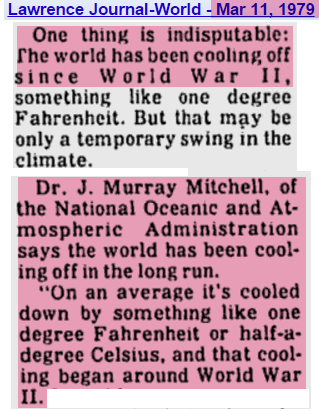 Evidence for the earlier warmth and post WWII cooling is very compelling . 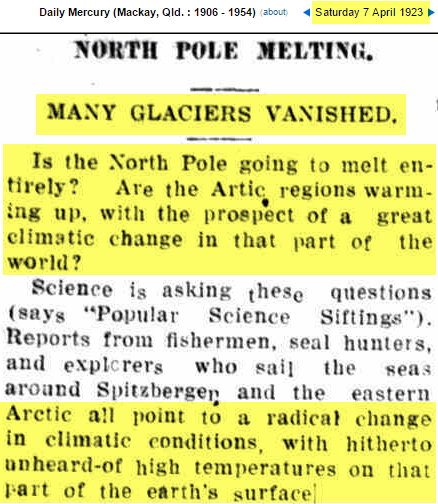 So why does it no longer appear in the NASA temperature record? 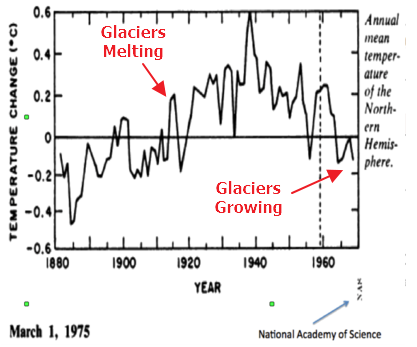 NASA shows the period during the 1960s when glaciers growing as warm, and the earlier period when they were melting earlier as cold. 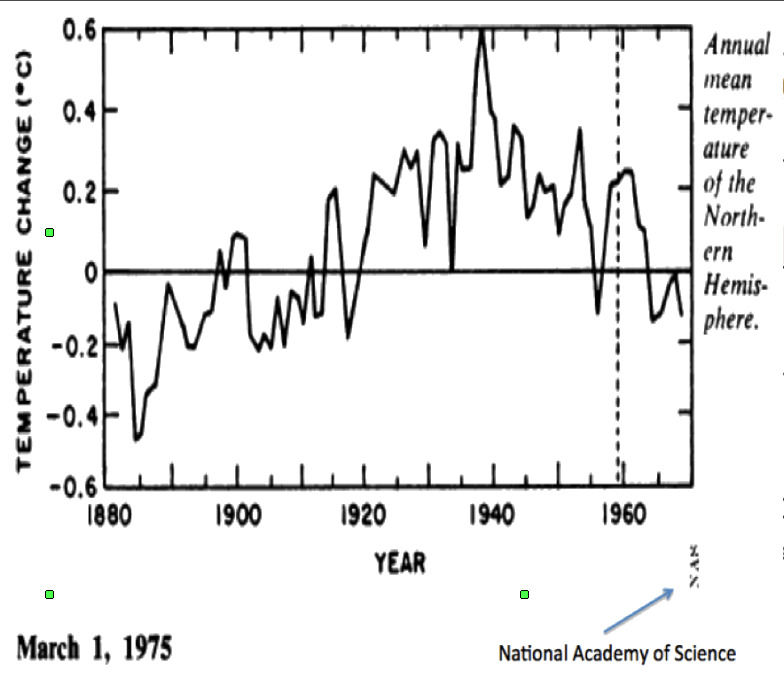 The NASA temperature record does not appear consistent with the evidence on the ground, whereas the 1975 National Academy of Sciences graph is consistent. 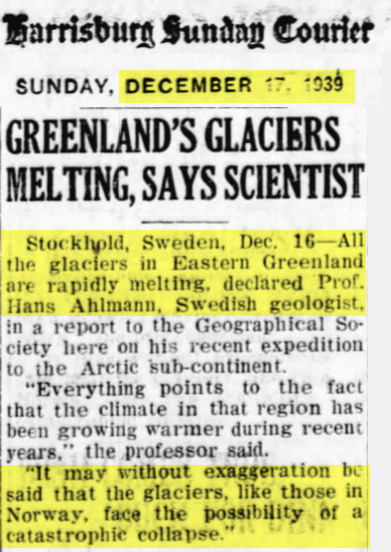 Removing the 1940s blip is exactly what NASA did. This is particularly evident in Greenland, Iceland and United States temperature data. 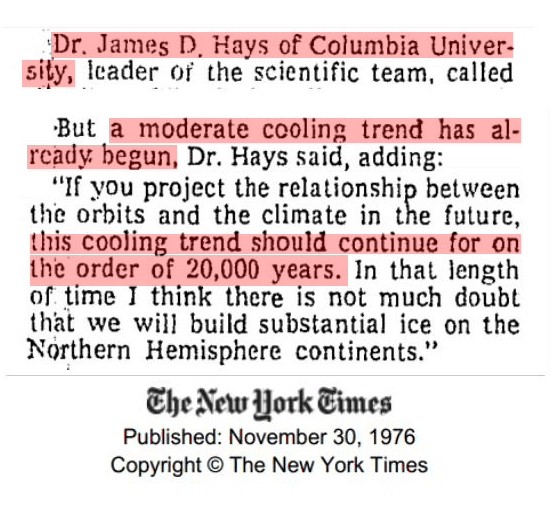 In 1999, NASA’s James Hansen reported that the US cooled half a degree since the 1930’s. 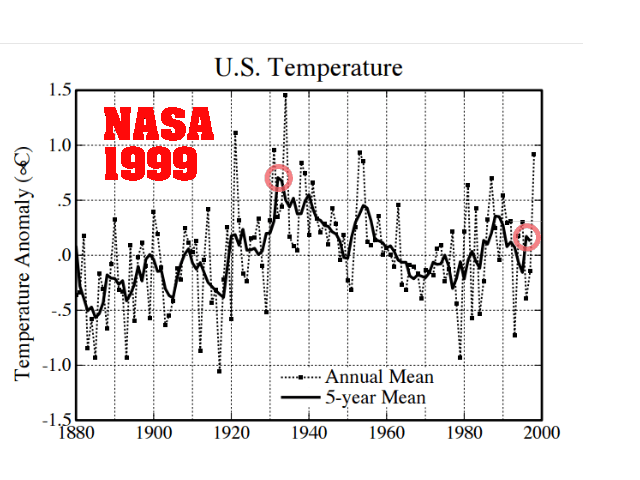 NASA now shows warming during that same period. 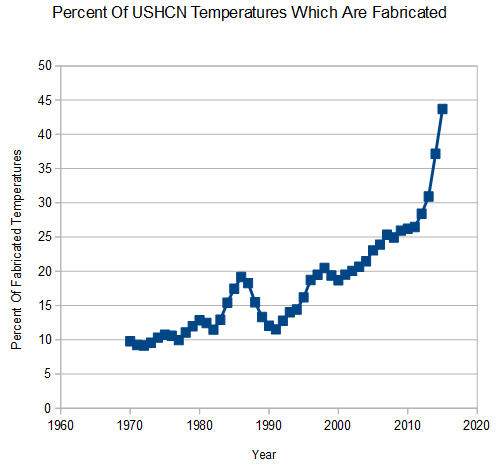 NASA US temperature data is based on NOAA USHCN data, which is massively altered to create the appearance of warming. 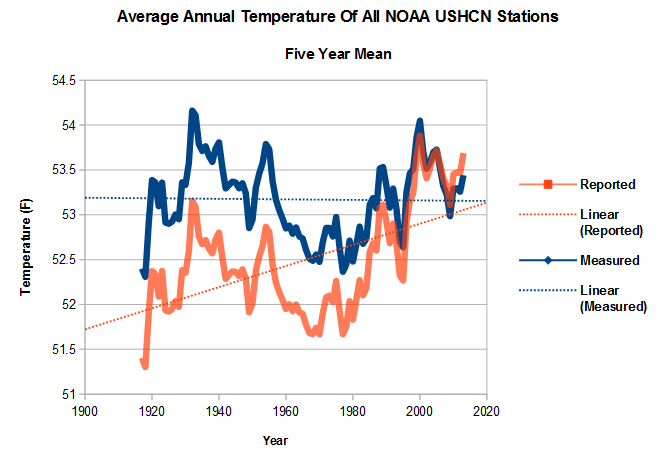 The graph below shows how the NOAA data is altered. The blue line shows the averaged measured temperature at all USHCN stations, and the red line shows the average adjusted temperature. 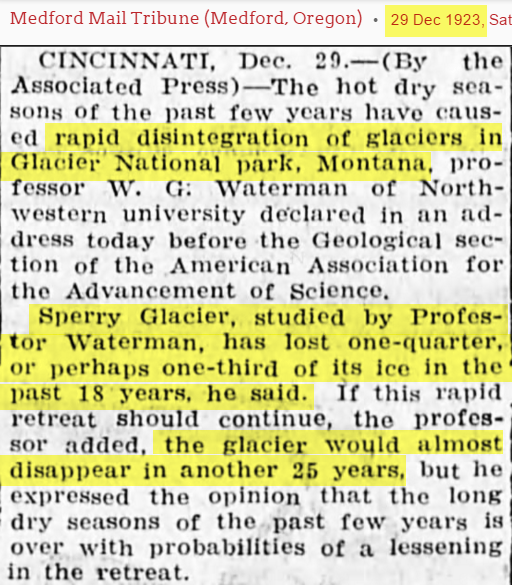 The warming trend over the last century is entirely due to “adjustments” by NOAA. Note how the “1940s blip” has been largely removed. 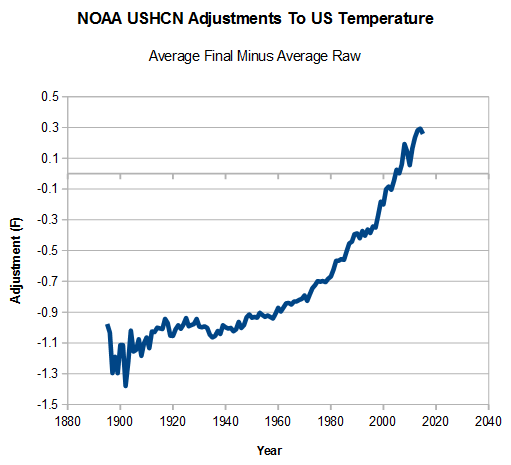 The image below shows the adjustments made by NOAA to the US temperature record – a total of 1.6 degrees F.
A large portion of these adjustments is due to NOAA simply making up data. If they are missing data at a particular station one month, they use a computer model to fabricate the temperature for that month. Since 1970, the percent of fabricated data has increased from 10% to almost half of the data. The US temperature record from NASA and NOAA is thus a completely meaningless fabrication, which bears no resemblance to the thermometer data it is derived from. The data has been adjusted to match the increase in carbon dioxide. In other words, it is being forced to fit to greenhouse gas theory. In summary, the NASA global and US temperature records are neither accurate, nor credible representations of reality. Tony, you have expressed and documented this amazingly well. The best way I know to sum this up in one sentence is that if you take the vast number of long standing US stations, not corrupted by urban heat island affect, there has been virtually NO warming since at least the 1930’s. 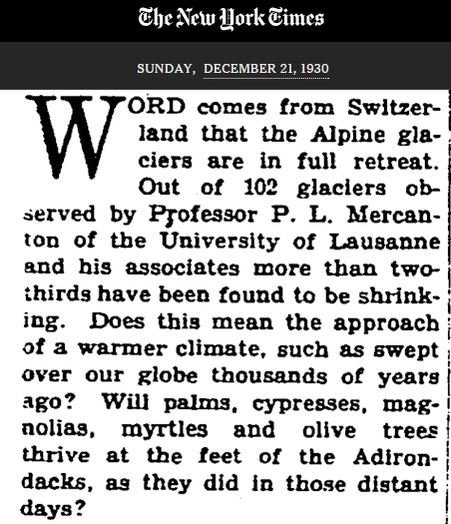 Nearly all the warming since 1880 took place between 1880 and 1940. 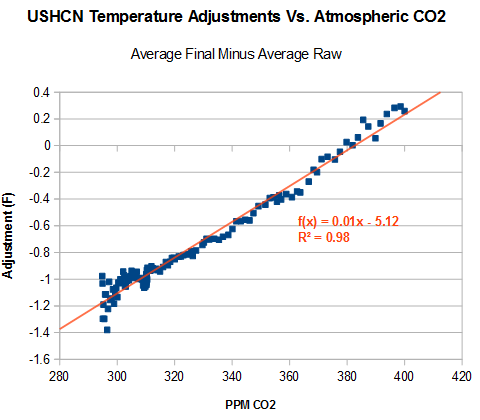 Thus there is NO correlation between increased amounts of CO2 and temperature. Nothing remotely approaching any sort of climate crisis. Doing a count down here. Five, four, three, two, one… wait for it…. Seriously though, how can anyone look at all those charts, examine the pattern of how the charts have changed, and still not come to the conclusion that the numbers are being purposefully altered to match an agenda? Jason, just to spike the guns of the whiners here are my comments with research backing up what Tony says. People should want to know why NASA can put a Man on the Moon but can’t manage to read a thermometer correctly! Of course the punch line to your last sentence is that NASA can’t put a man on the moon anymore. I have heard various estimates, but IIRC one NASA administrator said that if NASA started today on a serious man-on-the-moon project, it would take about ten years to pull it off. Ten years, and we did it in seven the first time. Heck, we are buying second stage rocket engines from the Russians, and the only way we can get to the space station is by hitching a ride on a Soyuz. How fallen are the mighty. Oh, for any true CAGW supporters out there, sorry if I shocked you, but no, sceptics do not generally think we never went to the moon. Commercial space companies will most likely beat NASA to the moon. There is the possibility of exploitable resources, after all. Many of us skeptics are Science Fiction aficionados and were glued to the TV or even traveled to Florida to see the shuttle lift-offs. 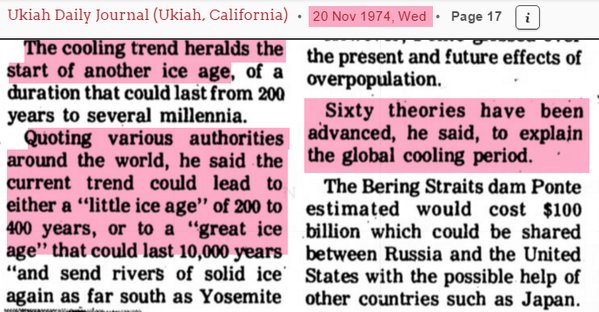 Most of the stuff the CAGW alarmists make up about skeptics would have us rolling on the floor in laughter if they were not so deadly serious. All the made up crap is enough to convince you it is whacked out politics before looking at any of the science. Putting a man on the moon (or any one of a multitude of things we now take for granted) required the science involved to work; otherwise the moon shots would have missed, or never gotten off the ground to begin with. Climate science doesn’t have to work; it only has to appeal to the right people. Another point to note is Ex-Senator Wirth and Hansen played their dirty tricks on Congress to get them to believe in CAGW in 1988. Clinton signed the UN Framework Convention on Climate Change on 12/06/92 and it was ratified. The USA has poured BILLIONS into the Climate Change fiasco. So one question WHY IN HADES does the USA have missing DATA and WHY is it INCREASING since 1988 and not DECREASING??? This is me channelling one frequent polemic poster here: “If the facts don’t fit the theory, change the facts;” exactly right. This litany scientific missteps continues to be ignored by the “Main Stream” news outlets and will continue to be ignored. If Bernie or Hillery win in November it will never see the light of day. Of course we have a long way to go until the election and anything can happen but the fact is that despite the press playing up the divisions in the Republican party the Democrats are fragmented worse right now. As things stand now I really don’t think that Hillary has much of a chance. All indications are her support is already going the wrong direction! When it comes to politics the JP Morgan owned MSM is going to drive the public to pick the candidates THEY want and not what is best for US citizens. They have done that for over one hundred years and the Elite have gotten richer and the American Citizen has been saddled with debt. …Total net American liabilities to the rest of the world now stand at more than $80 trillion. Remember at the beginning of Obummers term how Hillary Clinton spent so much time over in China? Remember that earlier Bill Clinton sold out the USA to China? Gail, you are probably aware that the main point of contention for the occupation of the wild life building in Oregon is that the BLM has been actively burning out the ranchers there so that their land can be bought cheap and then have the rights sold off. Yesterday the county fire chief quite in protest after he discovered that some of the troublemakers in town were in fact FBI undercover agents pretending to be militia. The goal has alway been to drive Americans off the land and into ‘sustainable housing’ aka micro-mini city apartments. The Elite want to eliminate the riff-raff from their hunting preserve and they also seem to be using Federal Land for collateral for the loans to the Federal Government. A group of farmers warned about that over a decade ago. Somewhere I have the references…. AHHHh yes the great Derry Brownfield, may he rest in peace. Private property rights advocates knew nothing about the plan either, and when they’d found out about it, the designation had already been assigned. The “stakeholders,” NONE of whom represent or are actually private land holders in the area, have put together a significant list of “Strategic Objectives” to control the use of land within the 21,000 square mile area. Yet when you examine the Nomination pdf that the “stakeholders” put forth to acquire the designation, there is no way the objectives can be met without regulation. First, let’s have a look just who the non-governmental stakeholders are and then what they propose to accomplish with this Blueway…. Sorry to be brief, but am seriously multitasking at the moment! The data just keeps building up that we have a criminal and immoral government. NBC/WSJ.polling is not getting any attention. In addition, only 20 percent [Record high – 2009 May 7-9 Satisfied — 35%] of the public believes the country is headed in the right direction, versus a whopping 70 percent who think it’s on the wrong track. And 73 percent say they want the next president to take a different approach from President Obama’s. “This will become a high hurdle for the Democrats at some stage of the 2016 election,” says Yang, the Democratic pollster. Any polling outfit not taking into account the 73% is push polling and not fit for consumption. 73 is the new 97 percent. Another keeper for my ‘data fraud’ file, and another post I will share with the masses. Thanks Tony! Very much a keeper Gator. It is nice to have it all laid out in one place. Makes it easier to ship off to others. None of the previous temperature data from either NOAA or GISS has been archived. It is only through the efforts of independent bloggers and others, who have privately kept their own records or used Wayback, that we can keep track of what has been going on. About the only thing we can glean from the official sources are the graphs themselves , which were published at the time and cannot be easily destroyed. Any reputable scientific outfit would always keep prior data, and be able to account for the differences. I have had many debates with people who denied that any adjustments had even been made. At least now they seem to accept them, and have changed tack to expect us to prove why the adjustments are wrong. DD More, yes, very important to remind newcomers about the Harry_Read_Me file. I have never met a CAGW enthusiast who had even heard of it. Whoever Harry was, I wonder if he was the person who leaked the emails and files. Thanks, Harry, wherever you are! As I read the Harry_Read_Me file, I kept thinking of what the FDA or FAA would have done to me if my labs records were in that poor a shape! please look into the case of Mr. Dobbins in the United Kingdom. Some of his numbers on his registered show herd of dairy cattle were not jibing with their passports, so Defra (Department for Environment Food and Rural Affairs, the UK’s USDA) took all of his cattle passports and confiscated his entire herd giving him 48 hours to positively identify all 576 of his cattle before they destroyed them. He couldn’t identify them because Defra had confiscated all of his documents. It’s like show me the title to the car, while I have taken the title and hidden it in my house thirty miles away. As an added slap in the face, no indemnity is necessary under EC regulations when animals are not identified in exact compliance with their regulations. The man’s entire livelihood was destroyed because not every piece of paper was in the prescribed order…. Now tell me how a few misapplied eartags or missrecorded numbers are enough to destroy a man’s entire life but the SAME government is willing to ignore a complete mess, including missing records, and other evidence of wrong doing. Not only ignores the mess but uses that crappy information produced as an excuse to kill hundreds of people a year? Gail that reminds me of the “Larry the Cable Guy” thoughts on cows. Everyone concentrates on the problems we’re having in Our Country lately: Illegal immigration, hurricane recovery, alligators attacking people in Florida . .. .. . Not me — I concentrate on solutions for the problems — it’s a win-win situation. * Dig a moat the length of the Mexican border. * Send the dirt to New Orleans to raise the level of the levees. * Put the Florida alligators in the moat along the Mexican border. Is it just me, or does anyone else find it amazing that during the mad cow epidemic our government could track a single cow, born in Canada almost three years ago, right to the stall where she slept in the state of Washington? And, they tracked her calves to their stalls. But they are unable to locate 11 million illegal aliens wandering around our country.. Maybe we should give each of them a cow. Yeah, Amazing, They want us to tag and track all our livestock and yet they have no problem with possibly criminal and disease ridden illegals flooding across our boarders. — schizophrenic much? So why do they want to tag granny’s flock of chickens? …the fact remains that the reason to locate livestock in 48 hours is to kill them to prevent the spread of disease. No, I won’t use the euphemism depopulate or as they said in the Traceability Business Plan ‘sacrifice’. One other thing. Remember last year when they used NAIS to locate the cows during the blizzard? That was not allowed by their own Draft Plan. The stated purpose of NAIS is to protect against disease. A blizzard isn’t a disease. What other purposes will USDA rationalize they can use NAIS for?…. Getting rid of the 1940ish peak was one of the prime aims of the homogenisation process. There are so many instances like Reykjavik, from all around the glode, that it has to have been intentional from the word go. A husband comes home from work once and there is lipstick on his collar; yeah, maybe some lady stumbled against him on the bus. Once he came home and smelled like perfume. Maybe it really is just a new cologne that the barber rubbed on him after his shave. But he comes home three nights a week with lipstick? And perfume? And missing a sock? There just might, just might, just might be a problem…. Ha! Good song! Well, I am no climate scientist, so if they say 2015 is “the hottest year evah!” then it MUST be true! Hubby’s out so I am listening to Celtic Thunder on his computer. Nice group! “It is a huge mistake to theorize before one has data. Inevitably, one begins to twist facts to suit theories instead of theories to suit facts”. Really a great presentation Steve. Thanks.